I’ve been waffling back and forth about how I want to spin my rollags for Spinzilla. At the end of it all I need a yarn that’s somewhere between worsted and aran weight, but couldn’t decide whether to spin 2 ply (faster, but out of my comfort zone) or 3 ply – chained plyed (slower, but my default singles weight and plying method). I posed the question to the members of A Spinner’s Study, as the members have become my go-to gurus for spinning knowledge. They totally understand me hemming and hawing over things like bobbin capacity, draft style, and muscle memory so they were happy to immediately offer multiple opinions. 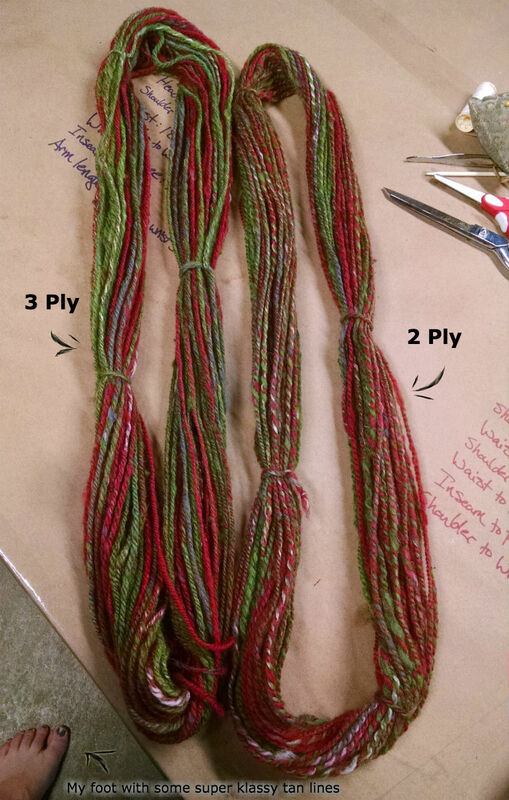 So I quickly prepped 8 rollags in some obnoxious holiday colors, turned on some Netflix, and started spinning. The 2 ply was definitely a faster spin, however it was much more uneven yarn in the end. I place some of that blame on the nature of the ply (it’s always easier to mask minor drafting discrepancies with 3 plys) and but mostly on my hand’s muscle memory. They kept wanting to go to my default and spin thinner, and then once I realized what I was doing I would overcompensate and draft too thick. The 3 ply was very easy to spin, but after doing the 2 ply it felt like it took forever. After taking it off the bobbin I was pretty sure this is the one I was going to pick – I like the finished yarn more than 2 ply. It just looked more like yarn, if that makes any sense. In the end though, the 2 ply is going to win out for this project. 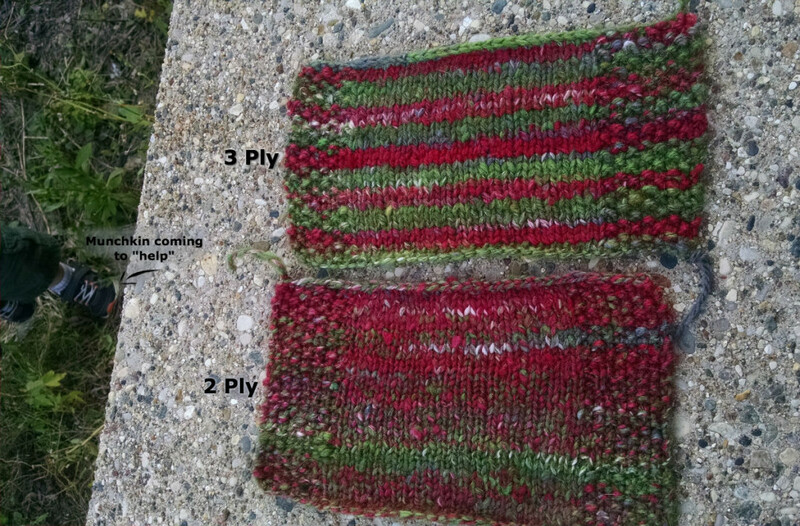 Both samples knitted up very well – and that’s a relief. When I try knitting some of my older yarns it’s so very apparent how overspun they are. Luckily though, my skills are improving, and both of these were very soft, drapeable, and had decent stitch definition. However, the density of the 3 ply was just too much for this particular sweater. I’m not looking for something to get me through the bitterness of February, instead something I can substitute for a coat in October and November. Also, as much as I like self striping yarn, I just don’t want it for this project. I like the mottled look the 2 ply gives, and with the fall colors in the rollags it should blend into a very nice brown with hints of orange, red, green, and purple.